Google has pushed out an update to the "3D Buildings->Best of 3D Warehouse" layer. This means models which have been selected to deserve the new "Blue Ribbon" status are now part of the default "Best of" layer (see tips on how to submit your 3D model). 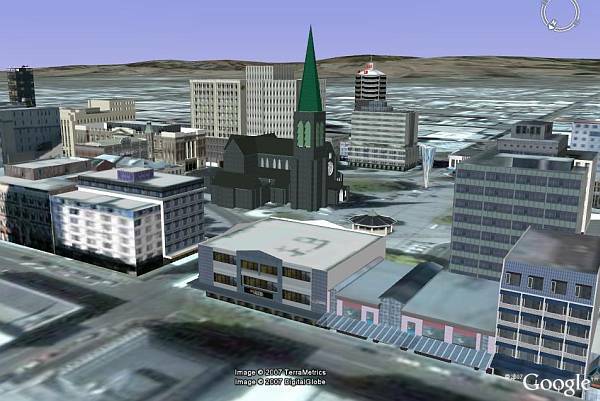 I had noticed there were a bunch of buildings being added to the 3D Warehouse for Christchurch, New Zealand a while back. The models were built by architects ZNO Christchurch (see their recent blog post). The ZNO guys had previously been using real architectural software and converting them over for viewing in GE over a year ago (before GE 4 came out). But, they now seem to be using SketchUp pretty enthusiastically. They say in their blog they will be adding more buildings every month. Right now it looks like several blocks in downtown are available. Another huge improperly scaled building can be seen at these coordinates: "39.48, 26.90" (western Turkey). Make sure the 3D Buildings layer is turned on. You may have to zoom out to about 20 miles to see it as the building is 11 miles wide. I imagine this will be removed from the layer pretty quickly. A GEB reader e-mailed me about it yesterday, so I told Google about it. There are cities all over the world getting 3D Buildings created by people using SketchUp. Check out cities like Chicago, Karachi, Rome, Barcelona, Amsterdam, Moscow, and more. Any idea when Google will be updating the 3D content in the UK?